Chic coat season is in full effect! We may already have a variety of midicoats, shearling overcoats and comfy vests, but there is something about a moto jacket that gets Us going. An undeniable essential, biker jackets mix and match with our casual and dressy ensembles with ease. Since we’re always on the hunt for a sensational design, we couldn’t help but swoon over this suede moto jacket, an upgrade from our usual leather motorcycle favorites. 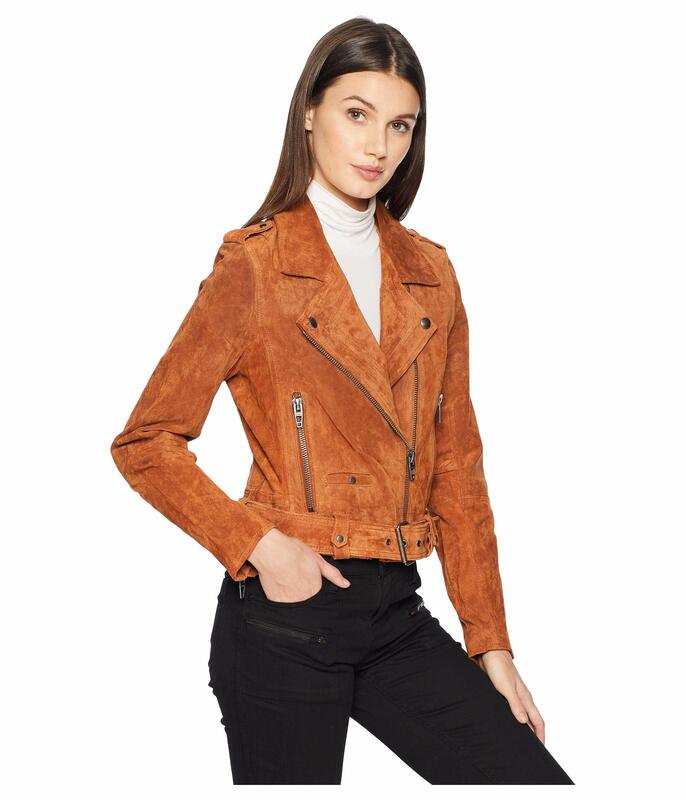 See It: Grab the BLANKNYC Real Suede Moto Jacket at 29 percent off the original price of $198, now $140 in El Dorado while it’s still in stock. Also available at Bloomingdale’s for $158. The BLANKNYC Real Suede Moto Jacket speaks to our love for all things luxury! Made from a 100 percent supple suede fabric and paired with polyester lining, this jacket is equal parts comfy and chic— an absolute must-have for the chilly weather season. Designed with a cropped silhouette, this garment hits right above the waist to show off outfits and layers. We can’t get enough of its edgy flair! Flaunting an oversized notched collar and shoulder epaulets, this smart-tailored topper exudes true biker babe flair. We also love the zippered hand pockets that keep our hands warm while storing our small essentials while we’re out and about. Complete with nail-head hardware detailing throughout, long sleeves with zippered cuffs and an asymmetrical front zip, this coat will definitely complement our wardrobe. Even better, the straight hemline with an adjustable belt makes it easy to layer for the ultimate functional style. We can’t stop swooning over the gorgeous El Dorado shade. Boasting a rich and textured burnt orange hue, this overcoat will make a fabulous addition to any vault. A fabulous pick that allows Us to welcome more color into the fold while giving our tried and true black moto style a break, this garment will become our new favorite in no time. We can’t resist a pretty earth-toned creation! Normally retailing for $198, the fashion Gods have smiled upon us with a 29 percent markdown, leaving Us with a $140 price tag. While most leather offerings can leave a major dent in our wallet, this affordable jacket has changed the game. We live for a chic moto jacket and we plan on hitting the streets with skinny jeans, booties, a fitted turtleneck, a cross-body bag and an infinity scarf for a fashionable ensemble. We can even switch gears with our dressy wardrobe by wearing our trusty LBD, slim-strap black sandals, a svelte clutch and layered jewelry to step out in style. For days when we’re looking to keep it casual, we’re pulling out leggings, Ugg slippers, a tunic and a shoulder bag to run errands. We can even flaunt our sporty style with knit sneakers, joggers, a pocket tee and a backpack for a laidback feel. Heading to work? Slip on a pleated skirt, mules, a bodysuit and a hobo bag for a fashionable finish. Versatile in nature, we count on getting plenty of wear for years to come. If you’re anything like Us and love to diversify your color options, there are other styles to load up on. For those who love chic neutrals with muted shades, the Bank Roll and Starry Night tones will fall right in line. Great for adding to our everyday lineup, we can serve up a variety of looks every time we step out. For fashionistas who are all about flaunting vibrant shades, the Red My Mind hue is just what we need. Offering a beautiful and rich hue, this garment will certainly take the place of our statement-making overcoat with ease. We can even stay true to our love of earthy tones with the French Grey color. Boasting a beautiful brown color that emphasizes the edgy and tough flair we know and love, it’s safe to say that we have already made space in our arsenal. With sizes small to extra large currently available, now is the time to scoop up this jacket while it’s still in stock.